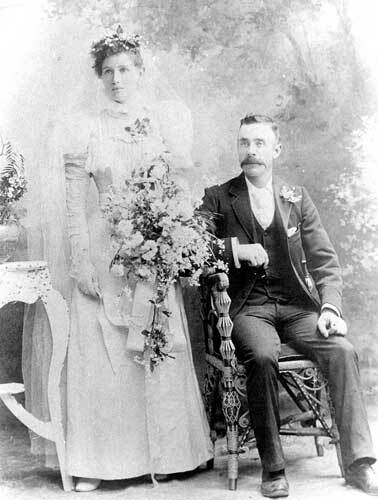 Edward and Matilda's youngest daughter, married James Daniel Whelan (1869-1942) at Wycheproof in 1898 (their wedding photo is shown below). James was the eldest son of Daniel James Whelan (1849-1927), a native of Birr in King's (now Offaly) County in Ireland. His sister, Martha Ruth Whelan, married Matilda's cousin, William John Shepherd, son of William and Jessie Scott Shepherd nee Stewart. Four months after he was married, James suffered a serious accident when the barrel of a shotgun he was using to shoot a hawk burst and 'a fragment struck him In the lip, cutting it open and severely lacerating his face' (Melbourne Age, 29 June 1898). The incident did little to quell James' interest in and enjoyment of shooting, however, as he remained a keen and active member of the local gun club for the rest of his life. The Better Farming Train on arrival at Wycheproof was met by a large number of farmers and settlers from the surrounding district including many returned soldiers and their wives from Mackie's Estate. The wet weather militated to a certain extent against a record attendance, but farmers travelled long distances to inspect the train, which was the first visit of such a train to this district. Mr. Mullett's lecture on cultivation of wheat was specially looked forward to by district farmers, who evinced keenness in this subject. Many questions were asked by the large audience. Lectures were given by Mr. Talbot, on the horse, and, on pig breeding by Mr. Burr; on sheep and wool, and the most suitable class of sheep for lamb production combined with wool qualities, by Mr. N. Bownian. The women's sections - which comprised lectures given by Miss Cacler, on needlccraft, cookery, by Miss Williams, and mothercraft, by Sister Peck - were crowded, and great interest was shown in these subjects by the women. In the evening, lantern lectures were given, on the home garden, by Mr. Jones; farm gardening, by Mr. Nicholls; poultry keeping, by Mr. Pedorick, and principles of cooking, by Miss Williams. Great interest was displayed in the exhibits shown on the train. Farmers will greatly benefit by such a visit. Cr. 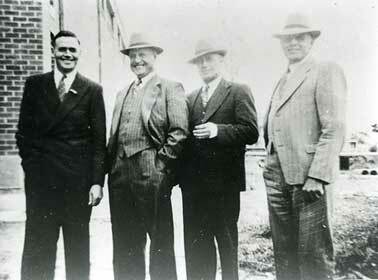 W. Matheson, for the Wycheproof Shire council, and Mr. J. Whelan, president of the Wycheproof A. and P. Society (14 October 1926). James and Matilda spent all their married lives farming at Wycheproof and nearby Cooroopajerrup. They both died at Wycheproof, James in 1942 and Matilda in 1943, and, we think, are buried together in the Wycheproof cemetery. 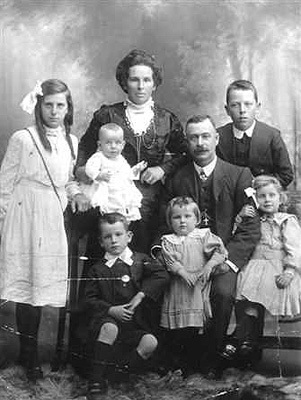 They had six girls and five boys, all born locally: Daniel Kevin (1899), Mary Catherine (1900), Matilda Veronica (1901), Annie Josephine (1903), James Patrick (1905), Joseph (1907), Kathleen Brigid (1910), Alice Eileen (1911), Edward Francis (1913), Sheila Agatha (1915) and Michael Mannix Bernard John Whelan (1915). Joseph died as an infant at Wycheproof in 1907. The other four boys, who are pictured together in the photo below, all reached adulthood. Whelan's 'Roscrea' homestead and the sons of James and Matilda Whelan nee Shepherd (taken in 1951). James Patrick Whelan and Edward Francis ('Ted') Whelan.
. . . to the district in the year 1873 . . . About the year 1878 with his brother Edward he selected land between Wycheproof and Corack. He then secured the license of the Glenloth Hotel, and later entered the hotel business at Wycheproof as licensee of the Terminus Hotel [which burnt to the ground in 1903]. He next went into store keeping by purchasing Mr Redgen's store, which he conducted for some time. For the past 5 years he has been engaged in grazing and business matters in the town. He had a cheerful nature and a tone of greeting for almost everybody. He was of a quiet disposition, but frequently displayed an Irishman's wit. Of late years he was connected with various town movements. He occupied the position of secretary of the Grain Shed Association, having been re-elected a few weeks prior to his illness. 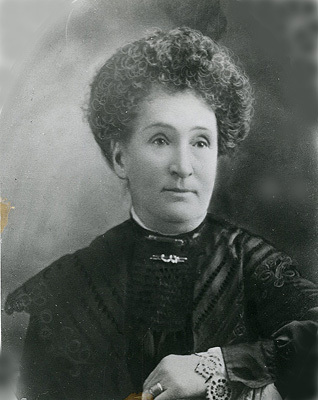 Mary Josephine Credlin nee Hurley (1856-1923). 1) Mary Josephine Credlin (1925-2015) who married Kevin Patrick Mulquiny, second son of James Mulquiny of Wooroonooke, at St Michael's Church at Wycheproof in 1951. A report of their wedding in the Melbourne Advocate (7 June 1951) tells us the bride was given away by her uncle, Michael Whelan, while her sisters, Sheila and Pat, served as bridesmaids and a cousin, Cecilia Whelan, was trainbearer. The bridegroom's brothers, Frank and Jim Mulquiny, were best man and groomsman respectively. Kevin's parents were James Mulquiny (1888-1968) and Frances Ann ('Annie') Johnson (1895-1990) who were married at Streatham in Victoria in 1918 and had five children in addition to Kevin: Francis Phillip, Joan Lilian, James Joseph, Betty and Brian Mulquiny. According to the 'Mulqueeny Family Tree' on Ancestry, Kevin's great grandfather, Patrick John Mulqueeny (1800-74) was born in County Clare in Ireland and came to Australia with his wife and family in 1852. The Australian electoral rolls show that Kevin and Mary were farmers at Wooroonooke before retiring to Charlton where they both died in 2015. Their respective obituaries published in the Melbourne Herald Sun on 4 August and 1 September of that year tell us they had four children - Lawrie, Greg, Philip and Angela - two of whom are married and, to date, have provided their parents with 11 grandchildren and four great grandchildren. 2) Patricia Alice Credlin who married Michael Cerretti Hogan in 1957 and farmed land at Mount Jeffcott near Donald in central Victoria. Although still to be confirmed, we think they had four children and Michael's parents were Timothy Francis Hogan (1890-1968) and Mary Ann Powell(1894-1964) who were married in Victoria in 1919. According to the 'Shepherd Family Tree' on Ancestry, Timothy's grandparents, Michael Hogan and Mary Quinn, hailed from County Clare and County Kildare in Ireland. Ronald Joseph Hogan, the son of Timothy's older brother, Michael James Hogan (1923-2017), married Marie Bridget Shepherd (1926-2012), the daughter of Edmund Shepherd and Margaret Donohue, at Lalbert in 1954 (see above). 3) Edward Luen Credlin (1938-2007) was working as a clerk in Wycheproof at the time of the 1967 and 1968 elections. He and his wife, Bettye, were at Coleraine in 1972 and Beulah in Victoria in 1977. They eventually returned to Wycheproof where Edward died in May 2007. His obituary in the Melbourne Herald Sun tells us he and Bettye had two children - Luen and Erica - and a granddaughter, Tia. 1) William Albert Credlin (1930-2007) who married Ivy May Smith in 1954, the year William was working as a police constable at Red Cliffs in northern Victoria. The Australian electoral rolls show that he and Ivy, who was also a constable in the Victorian police force, remained at Red Cliffs until at least the early 1980s. The Ryerson Index shows that William died at the Mildura base Hospital on 23 May 2007. His obituary, published in the Melbourne Herald Sun on 25 May the same year tells us he was then 'aged 76 years. Late of Red Cliffs. Loving husband of Ivy May. Loved father of Gordon, Cheryl and Bill. Father-in-law of Janet and Margaret and friend of Andy. Loved Pa of seven grandchildren. Loved son of Albert and Matilda (both dec.). Brother and brother-in-law of Bernard (dec. ) and Rosena, Kevin (dec.) and Val, Geoffrey, Leonard (dec.) and Brenda, Elaine and Pat.
. . . born on 23rd March 1927 in the Victorian country town of Wycheproof . . . [Bernie's] primary, secondary and tertiary education were all in Victoria and he qualified as a Civil Engineer in 1947. At that time T. A. Lang, the Commissioner of the newly formed Irrigation and Water Supply Commission, initiated a lively recruitment campaign which picked up a good crop of young engineering graduates and experienced engineers from interstate as well as from Queensland. Bernie was one of these recruits and all of his professional employment was in Queensland. Bernie first worked in the construction area both in Head Office and in the country. He was involved in the construction of many small weirs around the State and if we were ever driving near any of them he would detour and proudly show me some of his earlier work. In 1953 he was sent to St George where for 11 years he distinguished himself as an excellent District Engineer and respected member of the local community. While at St George he met and married a young nurse called Rosina Sherrin, affectionately known by all as Sherry. They had two daughters, Elizabeth and Tricia . . . Bernie developed a second passion while at St George; a love of country Queensland and the people who lived there. This passion stayed with him to the end of his life . . . [In 1965 he was appointed Executive Engineer Groundwater at the Queensland Head Office] At this time the Australian Water Resources Council was formed and one of its first tasks was to report on the Water Resources of Australia. One of the findings of this report was the glaring deficiency of groundwater education in our tertiary institutions. Bernie was a member of the first Groundwater Committee of the AWRC and was proactive in setting up an Education Sub-Committee and the establishment of Groundwater Schools to educate our Engineering practitioners and Hydrologists. These schools are still being held and are a valuable resource for the water industry. Bernie was tireless and meticulous in his pursuit of excellence in everything that he did. He did not seek recognition for his own efforts but rather identified and encouraged those younger officers in all fields who were doing their best to serve the people of Australia in the development and management of our water resource . . . Bernie progressed through the Commission as Chief Investigation Engineer, Assistant Commissioner and was Deputy Commissioner at the time of his retirement . . . He was a great historian. The newsletters were always extremely interesting because of the historical content, the information about members health and activities and the many humorous anecdotes which he researched and included. Bernie was a very compassionate man. He told me once 'Col, if I am ever out of town or even out of the country and any of the Commission staff dies or is seriously ill I want you to let me know immediately no matter where I am'. I did this and he always contacted the family immediately. If any retired staff members were in hospital, Bernie would go to visit them and he would go during his lunch break . . . And yet with all this passion for his work and his fellow human beings, his greatest love was for his family. In recent years his grandchildren have added a new dimension to his capacity to love. He loved to work with his hands and made many wonderful things, but I think his proudest achievement was building a beautiful laminated wooden rocking horse for his grandchildren. 3) Kevin James Credlin (1928-96) married Valma Shirley ('Val') Birthisel, eldest daughter of Constable and Mrs Birthisel of Boort in Victoria, in 1953. The Australian electoral rolls show Kevin, who worked as a carrier, and Val lived at Wycheproof until at least the early 1980s. Kevin died in 1996 and Val on 21 October 2009. Her obituary published in the Melbourne Herald Sun tells us she was the 'dearly loved sister, sister-in-law and auntie of Sylvia and Wes, Roger Alan and their families'. 4) Leonard John Credlin (1936-96). Born and educated at Wycheproof, Len married Brenda Mary Barry, who had attended Santa Maria College in the Melbourne suburb of Northcote, in around 1968. They lived initially at Wycheproof, where Len worked as a carrier and contractor, before, in the mid-1980s, moving to St Leonard's, a coastal township near Geelong, where they ran a general store. According to 'AErchies Archive' website, Len and Brenda separated shortly before Len's death in 1996. They had four children: Peta Credlin, pictured on the left, the well-known political adviser and media commentator; Nigel Credlin, an AFL-level former footballer and current administrator; and two other girls. 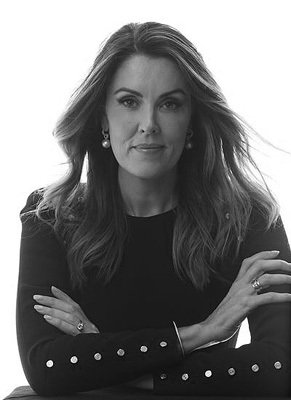 The website, which also describes itself as 'The Curmudgeon's Magazine' provides an interesting, if somewhat critical yet admiring, account of Peta Credlin's life and times up to and including the period of the Abbott Government. Two interesting snippets about her early life (all unsourced) include, first, that she was considered by some of her teachers at Wycheproof to be cleverer than them. Second, she attended Sacred Heart College at Kyneton where she was aclaimed for her debating prowess - and given the nickname 'full back' by her fellow debaters - as well as being 'noted for correcting her teachers should they make any mistakes'. Her Wikipedia entry informs us she graduated with a Bachelor of Laws from the Universty of Melbourne in 1998 and has a Graduate Diploma in Legal Practice from the Australian National University. As detailed in Wikipedia, she is more widely known for her involvement in Federal politics, first as an adviser and chief of staff to Tony Abbott, and, after Abbott's replacement by Malcolm Turnbull, as a commentator on Sky News Australia. 5) We think that Geoffrey Edward Credlin (1932-2009), who worked as a carrier, lived all his life at Wycheproof first with his parents and later with his brother Kevin and his family. He died from the effects of cancer at Wycheproof hospital on 17 November 2009. His obituary in the Melbourne Herald Sun (19 November 2009) tells us Geoffrey was the 'Dearly loved fourth son of Matilda (Whelan) and Albert. Loved brother of Bernard, Kevin, William and Lenard (all dec.) and Elaine (Mrs Paddy Donnellon) of Birchip, and very fond Uncle of 16 nieces and nephews. Aged 77 years. 6) Albert and Matilda's only daughter, Elaine Eveyn Credlin, married Patrick William ('Paddy') Donnellon, a farmer at Whirily near Birchip, in around 1967. Paddy was the eldest son of John Michael Donnellon (1895-1985) and Margaret Sophia Mawson (1907-90). His paternal grandparents were Patrick Donnellon (1861-1946) and Margaret Harty (1863-1959) who were married at St Bridget's Church at Corack on 8 August 1894 and farmed land at Whirily from before the turn of the century. Patrick was the eldest son of John Donnellon (c1835-1921), who, according to his obituary, published in the Ballarat Star on 25 November 1921, 'was born in County Clare 86 years ago and arrived in Australia in 1859. From Melbourne he proceeded at once to the diggings at Ballarat, and, after a short period bought land at Windermere. There he resided until he selected at Jeffcott in 1874, where he has remained. He married 60 years ago at Ballarat, his wife [an Irish woman from County Limerick, Honorah Moloney (c1838-1910] dying 11 years ago. The late Mr Donnellon was of a quiet disposition, and was one who could always be relied upon to extend a helping hand when occasion arose . . . He leaves a family of four, Patrick, Michael, John and Mary, to mourn their loss'. 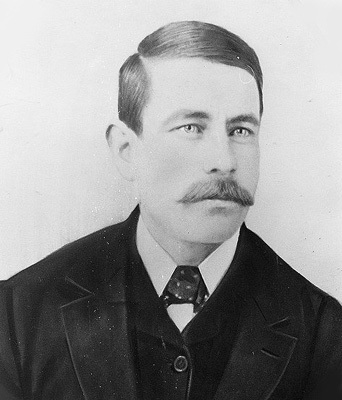 Paddy's maternal grandfather, William Harty (1821-1912), was another pioneer settler. Born at New Pallace, County Limerick in Ireland. he 'landed at Port Melbourne in 1852, and took up his abode at Colac, in the Western District. He was married in 1859 to Miss Mary Walsh, of Colac, by the late Rev. Fr. Family, and took up land shortly afterwards at Colac and followed up dairying pursuits. Some years later he sold out, came to Corack with his family in 1875, and followed farming and grazing pursuits. At the date of his death he held a large area of land' (Advocate, 7 September 1912). William's initial allotment at Corack, which he pegged in 1874 and obtained the title to in 1901, adjoined those of Denis Ryan and Pierce Stakelum whose son, William Patrick Stakelum, was a pall-bearer at William's funeral. 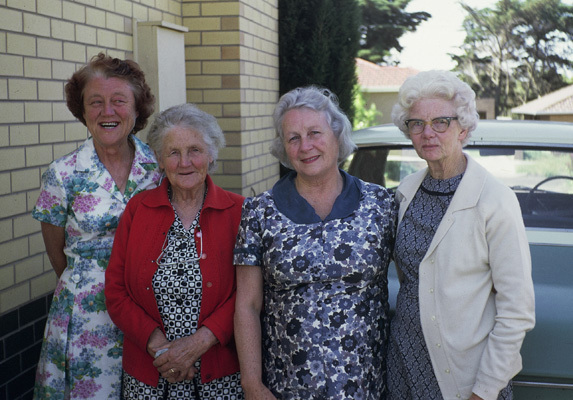 The Australian electoral rolls show the newly-wed Elaine living on Johnston Street in Birchip (along with two of Paddy's siters, Aileen Margaret, secretary, and Maureen Therese Donnellon) in 1968 and 1972. The 1977 roll has her registered as living at Whirily. The Ryerson Index shows Patrick William ('Paddy') Donnellon, aged 78, died at Wycheproof on 30 January 2014. His obituary, published in the Herald Sun (1 February 2014), tells us he was the 'Dearly loved husband and best friend of Elaine (nee Credlin). Much loved, respected and proud father of Geoffrey, Janelle, Bernadette, Luen and Anthony. Loved father-in-law of Eloisa, Anthony, Shannon and Ingrid. Darling Poppy of Sophia, Anastasia; Annie, Toby and Maggie; Isaac; and Ned . . . Dearly loved eldest son of the late John and Margaret (Mawson). Cherished brother of June, Dennis (dec.), Aileen, Brian, Maureen, John (dec.), Moya and Carmel. Brother-in- law to John, Maureen, Mark, Theresa, Paddy, Jeff. Much loved uncle of all his nieces and nephews. Flora and Michael's farm 'Chael-ora' was situated west of Dumosa and produced wheat, sheep & wool. Their home was of mud brick construction, reinforced with hoop-iron with handsome doorways, windows & fireplaces. The couple lived & farmed at Dumosa with their 6 children. 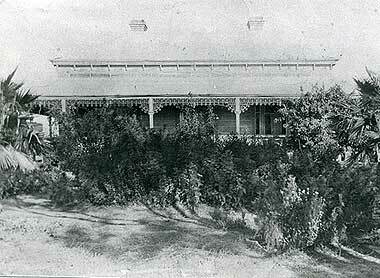 In May 1914 Michael leased his land and took his family to Drumcondra, a suburb of Geelong where Terrence was born. In 1918 the family returned to Dumosa. Michael passed away on the 9th September 1928. Florence remained on the farm which was being cultivated by their sons. In July 1935 Florence was given a farewell by her many friends at Dumosa as she intended leaving the district, but it was not to be as she died that same year in the Wycheproof Private Hospital. Her obituary in the Mount Wycheproof Ensign, told its readers that Flora had 'a generous and kindly, unselfish nature' and was 'a fine type of the Pioneer of her time'. The Catholic Church has lost in her a faithful & devoted supporter in Sunday School and Church work generally'. This was no better evidenced in her donation of the 15 pounds given to her at the farewell she donated to the Wycheproof Hospital and was used to 'put to a wireless and speaker system which was used throughout the wards'. Fee took over the running of the family farm at Cooroopajerrup from his parents when they retired to Wycheproof. After their marriage in 1926, he and Annie first farmed at Coorppajerrup and then, from around 1931 to 1954 at Dumosa (along with Fee's younger brothers Michael and Terrence Joseph). Fee was farming at Berriwollock in 1963 and died at Wycheproof two years later. The 1967 to 1977 electoral rolls have Annie regiastered at Nullawil where Michael Smith was also farming until his death there in 1974. Annie Josephine Monica Smith nee Whelan died at Geelong in 1984. Robert White tells us that she and Fee had seven children: 1) Felix James Smith (1927-99) who married Maureen Carmel Clements. Maureen died in March 2015. The tribute to her, published in the Herald Sun on 27 March 2015, tells us she was the 'loving wife of the late Felix. Cherished mother and mother-in-law of Kevin and Kaylene, Shane and Odin, Carmel and Robert, Margaret, Gerard and Gillian, Claire and Trevor (dec). Loved Granny of Rhiannon, Robert, Shannan, Brianna, Ashleigh, Erin, Sophie, Ellen and Kevin'; 2) Florence Sheila Smith (1928-89) who did not marry; 3) Daniel Mannix Smith (1930-2000) who married Theresa Fitzpatrick. His tribute, published in the Herald Sun on 4 September 2000, tells us he was the 'dearly beloved husband of Teresa. Loved father of Cathy. R. I. P. Loving son of the late Felix and Annie Smith. Loved brother of Felix (dec), Florence (dec), Brendan (dec), Anne, Laurie and Sheila'; 4) Brendan M. Smith (1935-96) who married Faye King and had four children; 5) Anne Smith who married Leon Cox; 6) Lawrence Smith who married Glenys Taggart; and 7) Sheila Smith who married Stan Prater. Both taken from Joanne Molloy's 'J L Molloy Family Tree' on Ancestry, the photo on the left is of Michael Charles and Florence May ('Flora') Smith nee Nolan and their family. Pictured in the photo above on the right, Sheila Agatha Mary Whelan (1915-81) married a Quamby-born farmer, Thomas Joseph James Coughlan (1919-74), in 1944. Thomas' parents were Thomas William Coughlan (1885-1957) and Julia Ann O'Callaghan (1886-1962), who were married at Lake Marmal in Victoria in 1910. His paternal grandparents were John Patrick Coughlan (1858-1941) and Elizabeth Ellen Scanlon (1856-1944). The Department of Veterans Affairs' WW2 nominal roll shows that Thomas enlisted in the Australian Army in the field in Western Australia in August 1943 (he was then living at Quambatook and gave as his NOK his father Thomas Coughlan). He was discharged on 18 May 1948 at which time he was a private soldier in the 103 Light Field Ambulance. Thomas' older brother, Maurice Francis Coughlan, had enlisted at Seymour in March 1941 and served with the 2/7th Infantry battalion until April 1946. It seems that Thomas also served in Australia's post-war Army until his death in Melbourne in 1974. The Australian electoral rolls show he and Sheila, who was then said to be employed as a textile worker, were living in the inner Melbourne suburbs of St Kilda in 1949. They then moved to Caulfield East where they lived until their respective deaths in 1974 and 1981. Thomas and Sheila are buried together in the Cheltenham New Cemetery, their burial plaque telling us they were the loving parents of three children:. Maree Therese and Kenneth Joseph Coughlan, both of whom were working as teachers in the 1980s, and Michael James Coughlan, who was a clerk. Return to Jane Elizabeth Ryan or Edward Shepherd and their families and descendants.